I couldn’t quite believe it when I found this image for sale in an on line auction, and so I bid for it immediately. 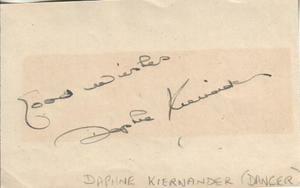 I had never heard of a Daphne Kiernander, as a dancer or otherwise, but I could see that she had been well known to some, including her fan “Peggy”, for whom she autographed the photo, adding her “good luck and best wishes always”. From her costume and poise she appeared to be a ballerina. A trawl through the Internet revealed that Daphne Josephine Kiernander was born in September, 1921 at East Preston, Sussex. I could find no reference to her early life, schooling, or creative training, but the next reference was for her part in the musical Bobby get your Gun, which ran for 92 performances at London’s Adelphi Theatre from 7th October, 1938. 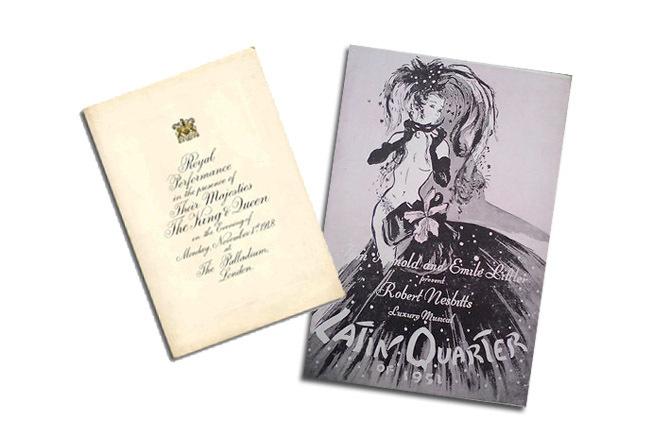 At this time, and until 1941 Daphne lived at Kensington Mansions, Queen’s Club Gardens, Fulham, and from 9th November, 1942, danced in Cole Porter’s new musical comedy Let’s Face It, which ran at the Hippodrome Theatre for 348 performances. She was one of the ensemble. After the war, Daphne was still performing, this time in Piccadilly Hayride (1946), which starred Sid Field and Terry Thomas, at The Prince of Wales Theatre, London. In 1948 she is shown living at West Kensington Court, Fulham, where she stayed until 1963. 1948 was probably the height of her career, as on 1st November of that year she danced at the London Palladium for H.M. King George VI and H.M. Queen Elizabeth at the Royal Variety Performance. In 1951 and 1952 she danced in two revues, Latin Quarter and Excitement, both at the London Casino. But in 1954, at the age of thirty-two, she moved into choreography, working on Mountain Fire at Liverpool’s Royal Court. This play with music starred a young Julie Andrews, who herself had perfomed twice at the London Casino, as well as at the 1948 Royal Variety Performance. In 1955 Daphne worked at London’s prestigeous Old Vic on The Taming of The Shrew. And this career change seems to have brought her work in The Netherlands as well as in England. She worked solidly for the following five years between the two countries, in England’s theatres and in Holland’s music halls, where she toured with her own troupe The Kiernander Dancers, until 1960. Daphne seems to have married in 1963, when she left an English firm for whom she had worked for two years as their Outside Publicity and Marketing Officer. After this, I could not find any more information. She is mentioned in R. Mander’s British Music Hall: A Story in Pictures (1965), and K. Ganzl’s The British Musical Theatre, 1915-1984 (1986), so these will be the place for me to start investigating. Daphne must have been immensely talented to have performed and choreographed such high profile productions, and to have had such longevity in her career. But it would be fascinating to find out more about the lady; where she was trained, whom she married, and what became of her. Sign me up to be notified when new articles are posted.